Add everything to mixing glass, cutting the twists, or at least squeezing them, over the mixing glass and dropping them in. Shake with ice and strain into a chilled champagne flute. Garnish with an additional grapefruit twist. Hmm…well, all ingredients are detectable, and the Milagro Silver that I used, which frequently dominates any drink it’s mixed in, manages to play nice with others. 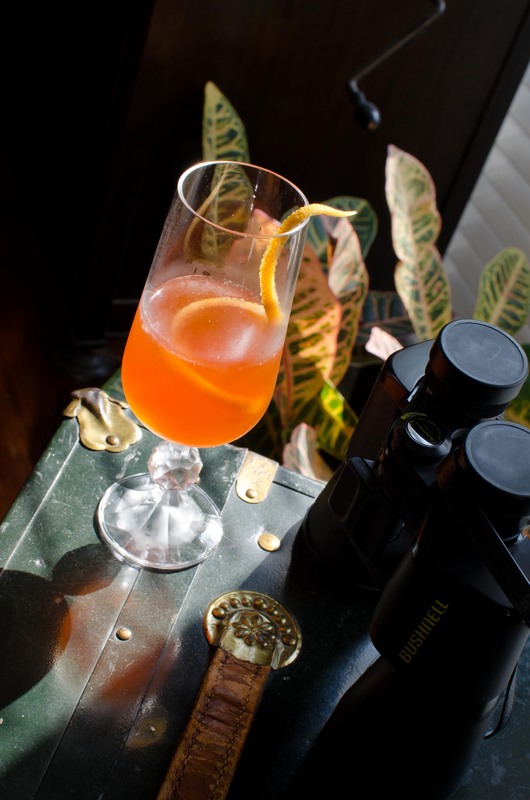 It combines with the Aperol in a way that reminds of the Vacation cocktail. I know some of you are wondering about the cacao, but, surprise of surprises, cacao works beautifully with tequila, especially silvers or blancos, which are more vegetal and match up with the bitter sweetness of cacao beans. Try a Frostbite or a Silk Stocking some time (the first being a tequila Alexander, then second adding a few dashes of grenadine to the same formula). The nose on this drink is very unique, consisting mainly of grapefruit, and the up-front taste is great, but the finish is, well, mild, bitter, and disappointing…vapid, if I had to pick a word. You’re left with the aftertaste of the grapefruit boosted (or rather, un-boosted) by the Aperol’s bitterness. However, I had a hunch about a remedy. A quick jog to the fridge and a 1/2 ounce pour of Noilly Prat later, the Interesting Cocktail becomes Very Interesting. The “vapid” finish is removed, the sweetness is bumped up ever so slightly, and everything is rounded out. The grapefruit disappears a little bit, I think, but on the whole, the drink is improved. Grapefruit Bitters may remedy the disappearance of the citrus, though that would only increase the complexity of the cocktail, and I think we want it to remain more accessible than a Tiki drink. Overall, a nice experiment. For those who’d like to see it, here is a link to Gary Regan’s article in the San Francisco Chronicle regarding the creation of this oddity. One wonders if his “reclusive” friend liked or disliked the “interesting” result of his impromptu mixing. 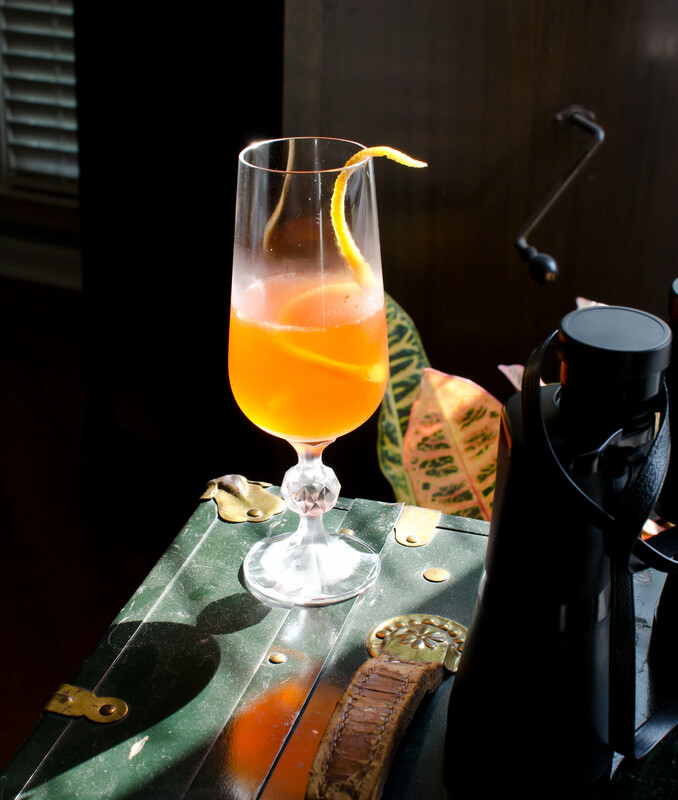 This entry was posted on July 26, 2011 by IJ Lauer in Aperol, Creme de Cacao, Drink Recipe, Dry Vermouth, Tequila and tagged aperol, blanco, creme de cacao, grapefruit, interesting cocktail, lemon juice, recipe, Tequila, vermouth.